Update: Leprechauns, shamrocks and the return of Berimond! This should help you enjoy Empire with a better level of performance! Again, in this update much of our effort was spent improving the overall stability of the game. It was the main topic of discussion for a long time, we had several tests to make sure the long standing problems would be fixed and now it’s time to see Leopold and Grimbert battling it out for the throne again! The Battle of Berimond is set to return on the 13th of March! Expect leprechauns, shamrocks and pots of gold, but most of all a new version of the Robber Baron’s King! To celebrate this holiday, a themed version of the Robber Baron's King will be available for you to defeat. The Shamrock Fortress will have a different appearance based on the traditional symbols of this special occasion. Defeating the target dungeon will also grant you a look item that will transform one of your castles, outposts, metropolises or your capital into a St Patrick’s themed fortress for a period of 14 days. The update should take place tomorrow between the usual time of 10:00am and 01:00pm CET. As mentioned above, the update is taking place. The downtime should last the usual of approx. 30 mins. Would just like to give you a little insight on the event schedule additional to what's in the game during King Eric's Challenge. As mentioned the Battle of Berimond will run from the 13th - 17th of March. 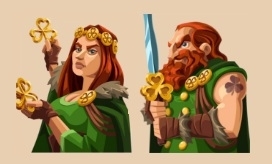 The St Patrick event will take place from the 16th - 23rd of March! We are aware that some players are experiencing login issues, please bear with us while we investigate. Edit: all issues should be resolved, please contact us in case you're still having issues connecting to the game.